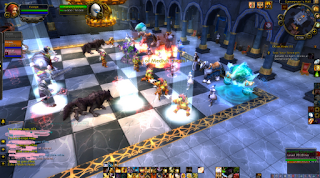 Adventures of the Hex Machine: What is going on with Karazhan chess? There are no words to describe how much I hate the feeling of having regressed. 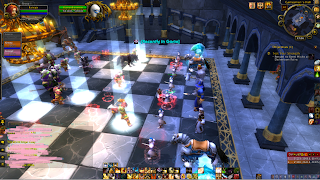 I had a very clear memory of soloing the Karazhan chess event in the past, and suddenly it didn't work out with three people. Something is very wrong with the chess game. The opposing faction's chessmen move much faster than they are supposed to, and much faster than you're able to move your faction's men. Echo of Medivh's cheats also seem to last longer and end up covering too much space on the chessboard, making it impossible to move your most important men out of it. I hope this is a bug. It has to be a bug. The most logical reasons for it are the haste changes that came with 5.0.4. There is also another buggy element to it, which occurs with the cheats. A much bigger area is covered with dark red, fiery graphic. 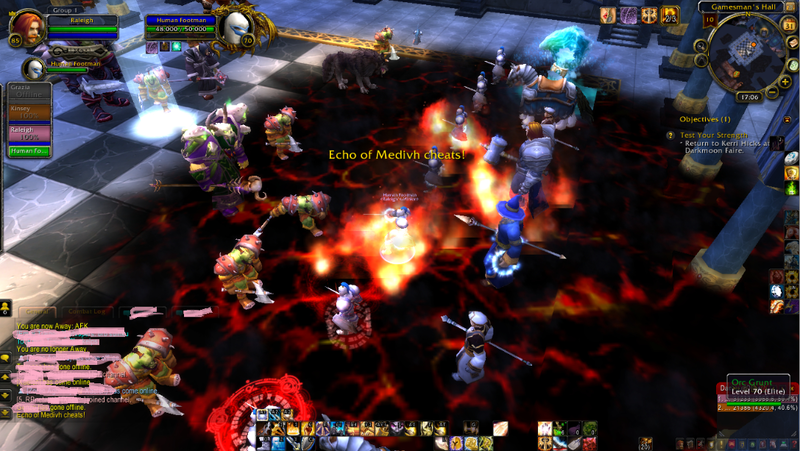 Similar strangeness was seen in the Cataclysm version of Scarlet Monastery when first entering the area with small fire elemental minions. The actual cheat fire is still visible, but looks very different from the other graphic. Another explanation is that Blizzard didn't want the encounter to be soloable, but it seems quite unlikely that they would change a level 70 encounter at this point. Regardless, for now I dare claim the Karazhan chess event is not soloable; not until what is likely a bug is fixed. The following screenshots are of me doing the event alone for demonstration. Approaching my FIRST move after activating King Llane. That is some aggressive chess playin'. "Time for an alternative scenario." BODOM-TSHH! Nope, but I'm sure it will be fixed eventually. Surely it's not a very urgent thing to fix, but it's likely a bug so. :) Should be fine. Still can't solo it, but did it w/ 2 people last night. 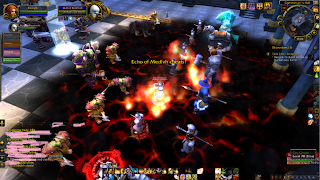 1 in the King, spamming Heroism and 1 in the "Queen" ice bolting the Warchief. Moved the 2 pawn in front of them first of course. Easy day.